It’s been a big week for us here at LaneSplittingIsLegal.com. First – and most importantly – I want to say a great big HUGE and heartfelt thanks to everyone: folks who liked this page, spread the word by sharing a link or putting a sticker on their bike, and especially the folks who supported the cause by ordering stickers. I also owe the wonderful folks at CityBike a huge high five for distributing stickers to all the shops in the Bay Area – this is a big deal. Show them some love by following their page. 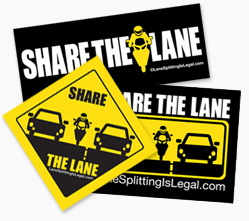 Second – CA Senator Beall introduced a bill to regulate lane splitting in California. The bill is confusingly vague, so much that many are trying to make sense of the intent behind the bill as well as what it would really mean. Right now, our position it that’s a superfluous and unnecessary bill. Some believe that having a law on the books helps protect splitting from attempts to ban it – that it’s harder to repeal a law and make something that is specifically legal illegal than it is to simply ban something. As I’m neither lobbyist nor lawyer, I can’t say if that’s true. I spoke to a staffer at Beall’s office on Friday and while he claimed to be unqualified to answer my questions about the intent of the bill, he promised to have someone call me back with some answers. I’ll keep reporting on everything I can find out about SB 350. If you’d like to reach him yourself, here’s his contact page. If you’re not in his district, it’s more effective to contact your local legislator – find ’em here. I also had my first “video production meeting” last Wednesday. We’re still in the early stages of the project, but we’re planning to produce at least a couple different videos: one for motorists and at least one for riders. More to come on this project as we get further along – very excited about this! As always, we’re working to add good stuff to the site. Along with the current batch of stickers, we’re going release the artwork under some sort of limited license so other folks can help get spread the word and create their own cool stuff. Thanks again to all of you, and ride safe!